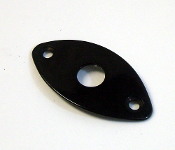 Standard Tele Control Plate: Cut from our pickguard material to match our pickguards. Definitely lets your Tele stand out from the crowd. US Fit and Import Fit Options (plates are US Fit unless otherwise specified in drop-down option selection menu). Your choice of colors.